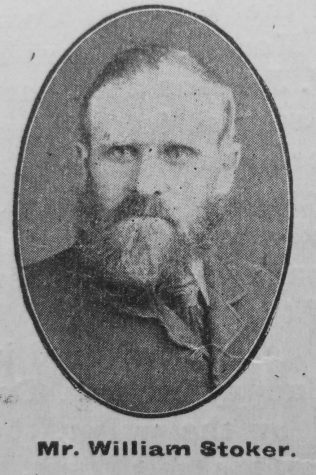 The Ryhope Colliery Society, Hendon Branch, has sustained a severe loss by the death of Mr. William Stoker, who, after an illness of three months’ duration, passed to the higher life, September 29th, 1903. Bro. Stoker was one of those rugged, robust, Christian miners who have done so much to make Primitive Methodism such a powerful influence for righteousness in the colliery districts; a man of sterling integrity, both inside and outside of the Church, which won for him the high esteem of all who knew him. When he came to Ryhope Colliery in 1862 he was a wild, reckless, worldly young man. His haunts were the public-houses; his delights were in dog-racing, pigeon-flying, and prize fighting: pursuits typical of the worldly pitman. But he had a godly mother, a member of our Church, who never ceased to pray for him; and on the occasion of a visit to Ryhope Colliery by Rev. W. Gelley, she had the joy of seeing her son converted. The old haunts and habits lost their charm, and henceforth he sought to live a Christian life. In the early days after his conversion he had a terrible struggle with the drink craving, and it was only the grace of God which enabled him to keep firm. On one occasion so intense was the thirst for drink that he could resist no longer. After passing and re-passing a public-house, hesitating and struggling with the desire, he yielded. He entered the bar, and placing half a crown on the counter, called for a glass of rum. To the consternation of all present, when he had lifted it to his lips, but ere he had tasted he dashed the glass and contents to the floor and rushed outside, leaving his change upon the counter. That was a supreme victory over temptation, for never after had he the desire for drink. Bro. Stoker was a member and official of our Church for thirty years, and bore a splendid record for devotion and service. No church could have a more faithful and loyal member. It was a great joy to him to be in the house of the Lord, in the class meeting, and the prayer meeting. When he prayed or related his Christian experience it was felt that there was no sham about him, but that he was a man true and genuine to the very core. He adorned his life with the Christian graces and virtues. He was a man with a wonderful fund of sympathy. Many remember him to-day because of his kindness and practical help in time of need. He was the soul of honour and goodness wherever he went, and a stranger to all that is mean and petty. William was born in 1843 at South Shields, Co. Durham, to parents Robert Stoker, a coal miner, and Jane Bell. William was married to Mary Jane (abt 1848-1883). Census returns identify four children. William married Mary Parkinson, nee Rosebury (1845-1914) in late 1885 in the Sunderland Registration District.